In the New Testament, the Second Epistle of Paul to Timothy, usually referred to simply as Second Timothy and often written 2 Timothy, is one of the three Pastoral Epistles traditionally attributed to Saint Paul. The three epistles are called "pastoral" because they relate to the conduct of church leaders, thought of as pastors (literally shepherds). It is traditionally considered to be the last epistle he wrote before his death. It is addressed to Timothy, a fellow missionary. Although the Pastorals are written under Paul's name, they are different from his other epistles, and since the 1700s scholars have increasingly seen them as the work of an unknown student of Paul's doctrine. They are speculated to have been written between 90 and 140. They don't address Paul's common themes, such as the believers' unity with Christ, and they reflect a church hierarchy that is more organized and defined that the church was in Paul's time. Scholars refer to the anonymous author as "the Pastor". There has been much diversity of sentiment on the question when this Epistle was written. That it was written at Rome, and when the apostle was imprisoned there, is the unanimous opinion of all who have written on the Epistle, and indeed is apparent on the face of it; see 2 Timothy 1:8, 2 Timothy 1:16; 2 Timothy 4:6. But whether it was written during his first imprisonment there, or during a second imprisonment, is a question, on which critics even now are by no means agreed. If the supposition of a second imprisonment at Rome, during which this Epistle was written, is correct, then it was written probably not far from the year 65 a.d. Lardner, however, who supposes it was written during the first imprisonment, places its date in May, 61 a.d.; Hug, also, in the same year. 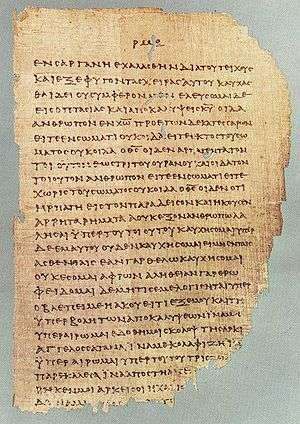 Some modern critical scholars argue that 2 Timothy was not written by Paul but by an anonymous follower, after Paul's death in the First Century. Jerome Murphy-O'Connor, however, argues that this epistle was written by Paul and that the other two pastoral epistles were written by someone else using this epistle as a model. For a discussion of 2 Timothy 3:16-17 on Biblical inspiration, see Biblical inspiration#Basis. Based on the traditional view that 2 Timothy was Paul's final epistle, chapter 4 mentions (v. 10) about how Demas, formerly considered a "fellow worker", had deserted him for Thessalonica, "having loved this present world". In sharp contrast to his dispute with Barnabas over Mark (Acts 15:37-40), which resulted in the two parting ways, Paul now considered Mark to be "profitable to the ministry" (v. 11). The chapter also features the only Biblical mention of Linus (v. 21), who in Roman Catholic tradition is listed as Peter's immediate successor as Bishop of Rome. ↑ "2 Timothy 1 Barnes' Notes". biblehub.com. Retrieved 2016-10-10. ↑ Raymond E. Brown, An Introduction to the New Testament (New York: Doubleday, 1997), pp.672–675.